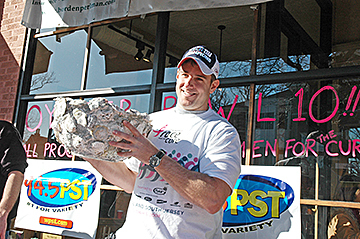 THE OYSTER KING: Chris Stevens captured the title at New Jerseys Oyster Bowl X presented by the Blue Point Grill on Super Bowl Sunday. The annual Slurp for the Cure represented one more round in the fight against breast cancer led by Komen for the Cure. Borough Council and Township Committee approved of Sustainable Princetons action plan and goals during a joint meeting between the two municipalities last Tuesday. Ways to make Princeton greener by balancing economic, social, and environmental aspects of the community were discussed. The Princeton Environmental Commission (PEC) heard a presentation by residents concerned by synthetic turf in Barbara Smoyer Park and another presentation by Daniel Harris from the People for Princeton Ridge, as well as discussing their goals for 2009 at the meeting last Wednesday. The Regional Planning Boards Master Plan Subcommittee met last Wednesday to discuss the draft amendment to the Princeton Community Master Plan, which would add a summary and assessment of Princeton Universitys 10-year campus plan to the document. Drummer Lenny White, whose styles include jazz, rock, funk, and fusion, will perform in concert on Friday, February 13, at 7:30 p.m., in the Princeton Regional School’s Performing Arts Center.